In the classic Depeche Mode song "Just Can't Get Enough," the lyrics speak of not being able to get a sufficient amount of time with a paramour. Well, in this case, when it comes to SUVs we just can't get enough of the 2013 GMC Acadia which is to our eyes, just enough SUV to qualify as a true all you could ever want family hauler. If you need more space for family, might we recommend something in a Motorhome? Not only is the Acadia amazing for being able to haul 7 or 8 passengers, it is amazing that it can haul that many adults comfortably without being a needless parking space hog. Now we so can't get enough of the Acadia platform that we think there is plenty of room on the market for its siblings known as the 2013 Buick Enclave and 2013 Chevy Traverse if ever there was a trio made in the style of true GM platform sharing. Without question the Enclave is the suave and sophisticated one in the family, the Acadia Denali as was driven here was the stylish workhorse. The Chevy's blandness took points away from it but in the end this every man and woman approach will no doubt win the vehicle more sales from GMC and Buick. But even beyond its role at GM, does the 2013 GMC Acadia serve its purpose as the modern day 7-passenger family station wagon minus the vomit inducing rear facing station wagon-style "third row" that they had in the "old days" spanning through the 1950's on until the late 1980's. Yes, the 1980's are now considered the "good old days" too and the music from that era like the aforementioned Depeche Mode is labeled "Classic Rock." Feeling old yet? There are two trim levels of Acadia, the standard version and the upscale Denali variant which is kind of like a trim pickage that gives you a number of style and feature enhancements with no basic change to the powertrain. The 2013 Acadia starts at just $34,050 very well equipped with climate control, power everything, USB/i-Pod connectivity, 18-inch aluminum alloys, Sirius/XM, Bluetooth, On-Star, a back-up camera and touch screen premium audio just to name a few. That's a lot of SUV for the dollar. Our test 2013 GMC Acadia Denali came standard with a 3.6 liter 288 horsepower V6 engine, a six-speed automatic, 20-inch machined aluminum alloy wheels, a dual pane power moonroof, exclusive cocoa dune interior leather with French stitching, leather wrapped, mahogany steering wheel, tri-zone climate control, Premium Bose Audio, 8-way power passenger/driver's seats. Heated/ventilated front seats, power rear liftgate, and a whole lot more for just about $50,000 out the door. Our tester was EPA rated for fuel economy at 17 city/22 highway and over the course of a week we averaged a so-so 17.8 miles per gallon. Remember, this is a very large and heavy SUV meant to do everything for you and your family whenever you ask it to. You really expect such an all-purpose carry-all to get 50 miles per gallon? Maybe one day. Thankfully, a 22 gallon fuel tank ensures that the Acadia has a very, very handy cruising range for road trips. This SUV is purpose built for road trips with family and friends. Bulky, blocky and shaped like a big Tonka truck, the 2013 GMC Acadia just oozes testosterone from its every angular and solid looking angle. New for 2013 is a new rear end LED design as well as a new front end HID Xenon headlamps as standard. Other changes made to this lightly updated 2013 version of the Acadia also include redesigned front and rear fascias and other minor detail enhancements. It's still the same basic Acadia underneath just with a few nips and tucks to keep things fresh. The exterior styling of the 2013 GMC Acadia Denali is set apart from its platform mate mainly by the strength of its ultra-chromed out grille which echoes a flame surfacing pattern all across the front. Whereas the standard gradeAcadia has a grille with ventilated slats, this one has a flatter area of chrome surface out front. The Denali also has body color bumpers and chrome satin finishing where originally there was just body color and "regular" chrome. Ruggedly purposeful in places and downright luxurious in others, the interior of your Denali will come outfitted with as many toys as you can possibly imagine but no matter which model you choose you always get the same terrific use of interior space and class leading combination of cargo and passenger hauling capabilities. Truly, when it comes to SUVs the Acadia has no real equals as it offers room for 7 or 8 adults and can still do that with a cargo hold filled with Christmas presents. This stuff matters to a lot of people. As for cargo space, behind the third row of seats there is still a mighty impressive 24.1 cubic feet of cargo space when you have a full load of passengers with that growing to 70.1 cubic feet of space with those seats folded flat. Fold down the second row and you can practically park a Nissan Juke inside the Acadia what with 116.1 cubic feet of cargo space on offer. Truly, that may be an exaggeration but we have seen Manhattan Apartments that are smaller than this SUV's massive cargo hold. Build quality in the interior of the Acadia is always exemplary with terrific levels of fit and finish, nary a squeak or rattle and every piece of plastic seemingly chosen for not only attractiveness but also durability once you throw children or the family pet into the driving equation. We are not recommending you let the dog drive, we just know a lot of you drive with your pets along with you and in this regard the Acadia is a terrific choice. But to our tastes the 2013 GMC Acadia Denali interior has just the right mixture of an upper middle class hunting lodge and the khaki pants that your father used to wear every Sunday to Church a la Ned Flanders from "The Simpsons." The leather is truly sumptuous and soft with a buttery rich feel to it that only General Motors has seemed to master as of late with Cadillac and now GMC. The wood trim, in and of itself, is a masterwork of class and sustainable believability that it's really wood. Toyota needs to study this one for use in the next Highlander. Class dismissed. One of the most impressive pieces of work in the 2013 GMC Acadia is the standard 3.6 liter 288 horsepopwer/270 lb. feet of torque V6 engine which offers up a heady and potent mix of plenty of accelerative potency and a growling soundtrack when pushed that is nothing short of sporty. Usually most SUVs don't encourage you to want to drive faster but the Acadia is kind of a bad influence with the engine and seamless work of smooth 6-speed automatic working as little devil's on your shoulder. And everything is fine around town and on motorways but when entering a mountain road corner at full speed in the 2013 GMC Acadia, you'll notice one thing. That this puppy likes to push wide and hard—in other words, massive under steer. Also, brake feel is a bit soft at first but firms up nicely as the pedal progression kicks in. Thankfully once you get a feel for the size of the Acadia, it's quite easy to lurch her about a bit. This is one of those SUVs that quite literally shrinks in around you and becomes almost like second nature to you much as it would be to move your own body. The steering may seem a bit light to first time drivers but after you get accustomed to it you see that it makes navigating this large SUV in parking a breeze. And don't mistake the lightness of the power steering to confuse you into thinking the system offers no feedback to the driver because this system somehow manages both lightness and a healthy knowledge of what your front wheels are up to. It feels connected thereby heightening the cocooned in feel of the Acadia driving experience. Body roll is kept in good check when going around corners and thanks to that talkative steering rack it's pretty easy to keep the SUV headed exactly where you want it to go. Because not only does this make the Acadia, a pretty darn fun to drive SUV but it also makes it easier for you to avoid accidents. But in case you don't you can rest easy knowing that the 2013 GMC Acadia is an IIHS (Insurance Institute for Highway Safety) "Top Safety Pick" for crash test safety. As far as competing entrants go in this price class, our minds would race of course to the 2013 Kia Sorento and Hyundai Santa Fe with their like-minded seven passenger ethos. Then, of course, there is the 2013 Land Rover LR4, 2013 Dodge Journey, 2013 Ford Flex, 2013 Honda Pilot and 2013 Mazda CX-9. So there you have it, quite a bit of competition but thankfully GMC fights back with not only the Acadia, Acadia Denali but also the Enclave and Traverse. There is a version of this SUV platform for truly any taste and most budgets. Without even going into how enjoyable the Acadia is to pilot for an SUV of this size it is easy to see that the Acadia simply trounces all comers when it comes to cargo and passenger hauling ability. Not only is the third row comfortable for adults but you can configure the vehicle for seven or eight passenger seating which is something you can only get in a much larger SUV. So if you have a large family, this may be your best and only real SUV choice. The only thing that competes are minivans, Tahoes and Suburbans, space wise. But trust us, not as enjoyable to drive as the Acadia. Our testers drove a 2013 GMC Acadia in the Denali trim for a week to create this road test and the vehicle was provided by the manufacturer for testing use. 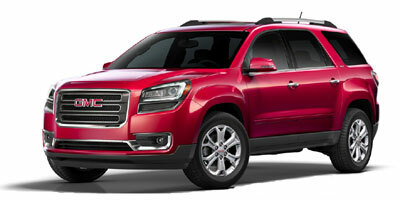 Interested to see how the 2013 GMC Acadia ranks against similar cars in terms of key attributes? Here are the 2013 GMC Acadia rankings for MPG, horsepower, torque, leg room, head room, shoulder room, hip room and so forth.